I do enjoy decorating eggs with polymer clay. 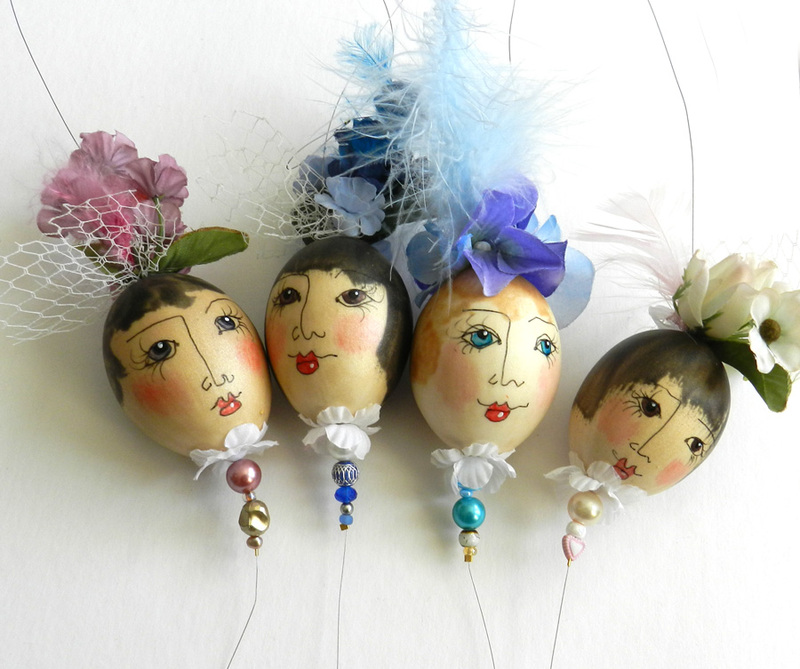 These blooming beauties were first blown free of their egg-y contents, then coated with several cured coats of liquid polymer clay.I drew the faces with a Micron permanent ink pen, colored them with acrylic paints and gathered the bits and pieces for their hats. Then came the decorating fun! These were strung up on strands of acrylic coated wire with beads and a lead crystal prism, for hanging decoratively in a window and catching rainbows. I’ve got these four available in my etsy store, and I’m also going to list some of the undressed (gasp!) egg ladies for those who want to do the dress up fun themselves. I’m going to grow my etsy store this year, and I’m planting listings now!